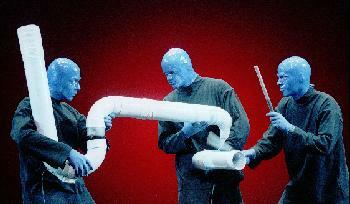 After running in New York since 1991, Blue Man Group comes to London for the first time. It is a moneymaking masterpiece. With no actor recognisable behind a bald blue head mask, Blue Man Group can play simultaneously in many different cities without anyone feeling that they haven't seen the original actors. I found myself both fascinated and repelled by this show. Although they claim not to be clowns, their brand of physical accosting of members of the audience has its basis in clowning. At the end as enormous rolls of paper are unrolled and moved towards the stage I was reminded of Slava's Snowshow where the same kind of audience involvement saw giant balls passed through the stalls and the auditorium was snowed in paper. When a member of the audience was turned into a human paint brush and was covered in paint, hung upside down and banged against a canvas, I was uncomfortable with what was being presented as entertainment. I found the regurgitating diners puking out of pipes in their chests repulsive although, bizarrely, the member of the audience called in to participate seemed to be having fun. I did like the serious point they made about the anomaly of people sitting next to each other in internet caf�s, ignoring the real people next to them but "messaging" animatedly to someone on the internet. 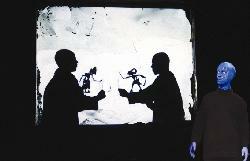 For a completely different take on the Blue Man Group see my colleague Les Gutman's review in New York. My question to him is this: with all seats at �40 and �50 in London, are not Blue Man Group themselves as much to do with commerce as art? In an early scene in this enduring shrine to everything that's good in downtown performance art, one of the Blue Men, famously, pulls paint balls out of a gum ball machine and tosses them across the stage into the mouth of one of his two colleagues. The recipient then spits the paint onto a canvas. Into the other Blue Man's mouth, he throws little balls of clay. Perplexed by what the clay looks like on canvas when he mimics his counterpart's artistic effort, and confronted by the rapid-fire addition of more and more wads of clay into his mouth, the second Man burps up a little statue. To which he promptly adds a $4000 price tag. To much of the audience, this scene is remembered as a signature of Blue Man Group's often-gross, sometimes painful-looking but always-funny entertainment. Yet, in the simplest of terms, it establishes the central message conveyed by the show, and indeed of the Group itself. What is art? What is commerce? And how do we define the line between the two? That Blue Man Group, which has clearly outgrown its origins in Ellie Covan's Dixon Place living room to become a major entertainment enterprise of which other downtown artists can only be envious, is a commercial success cannot be denied. What's remarkable is the extent to which it has remained art in the truest sense of the term. While Blue Man Group is a rollicking good time, it neither shies away from, nor hides behind, its cultural aspirations, even after it has come to depend on busload after busload of tourists. We revisit Blue Man Group now (our earlier review is linked below, and I won't repeat its basic introduction to Blue culture) to take in the some recent updates to the show (primarily in the second half). Lest anyone think the Blue Men have landed in a world that's thirteen year's old (which is, amazingly, how long the company has been ensconced in the Astor Place Theatre), newly-added segments include a primer on how to be a rock star in the 21st Century, and a visit to an internet cafe (where, with typically trenchant observation, it is noted that people go not to communicate with those present, but rather with those who are not). An additional new section does a wonderful job telling us the history of animation. It's reason enough for theater-goers to re-remember this destination, and not just when searching for a safe bet when confronted with a horde of out-of-town guests. Simply stated, Blue Man Group is cooler than cool, hipper than hip: there is no audience too sophisticated, or too unsophisticated, for what they offer. It's about as universal as the theater gets, and I defy anyone to avoid having a rewarding time.